A missing front tooth may be the result of trauma (knock), failure of nerve treatment (endodontics) or a fracture of the crown and/or root. In this case, the patient had a recurrent infection (fistula) after several nerve treatments that made it impossible to preserve the tooth. After extracting the incisor tooth and cleaning the infected area, a provisional tooth is made that is attached to the adjacent teeth. This allows the patient to live a normal life until the infection is completely cured. 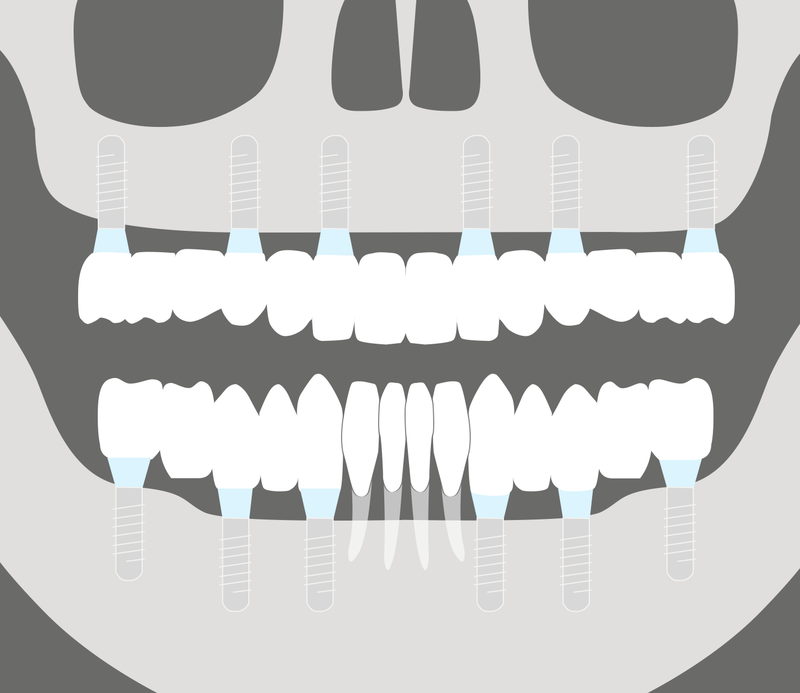 Next, an implant is inserted to replace the tooth’s root and again a provisional tooth. Finally, an aesthetically pleasing crown is made without metal, which is screwed in to hold the implant firmly and definitively in place. 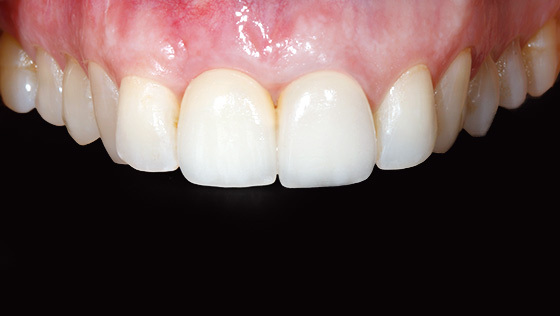 While this treatment was being done, the patient asked to change an old metal-ceramic crown for another crown without the metal aesthetic of her other incisive tooth. The solution given was to replace the lost tooth with a fixed alternative that is as close to a natural tooth as can be, without affecting neighbouring teeth as happens with dental bridges. The patient came to the surgery with a removable prosthesis that irritated her gums and caused sores at various places in her mouth. Another problem was the poor grip and instability of the false teeth when chewing, though attempts had been made to adjust and pare them down several times. All of the teeth in the upper jaw and the back teeth of the lower jaw improved their grip by having fewer implants, thus dramatically improving chewing while preventing the sores from appearing. Immediately after inserting the implants, the patient was given a set of provisional fixed acrylic teeth that alleviated her discomfort. 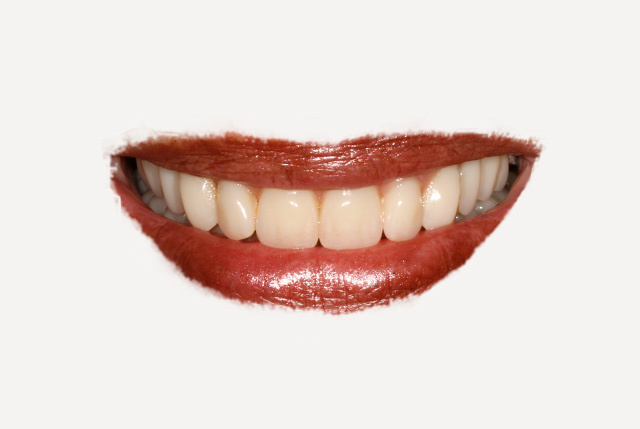 The definitive teeth were then made in no hurry by using a system of computer-aided design and manufacture (CAD-CAM) in zirconium (white metal), a material that is highly biocompatible with gums and gives a very natural appearance. Upper jaw prosthesis over 6 impl. full arch. Bridges for back upper jaw over 3 impl. 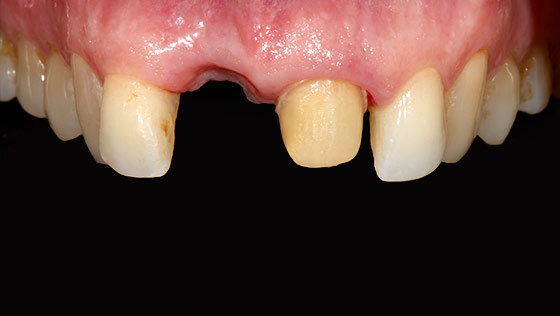 In this case, the patient suffered from advanced periodontitis with the upper teeth gradually becoming looser, which had very little supporting bone on which to hold. The treatment was carried out in a single session. It involved removing the loosened teeth, inserting four zygomatic implants and restoring all the teeth of the upper jaw with a temporary fixed prosthesis with no palate, all within 24 hours. 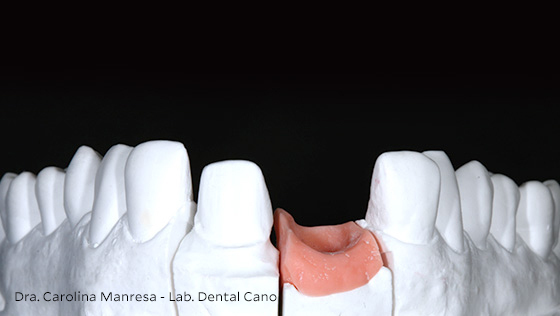 The final prosthesis (designed and manufactured with the CAD-CAM system) was made-to-measure for the individual and definitively fixed in place three months after the operation. 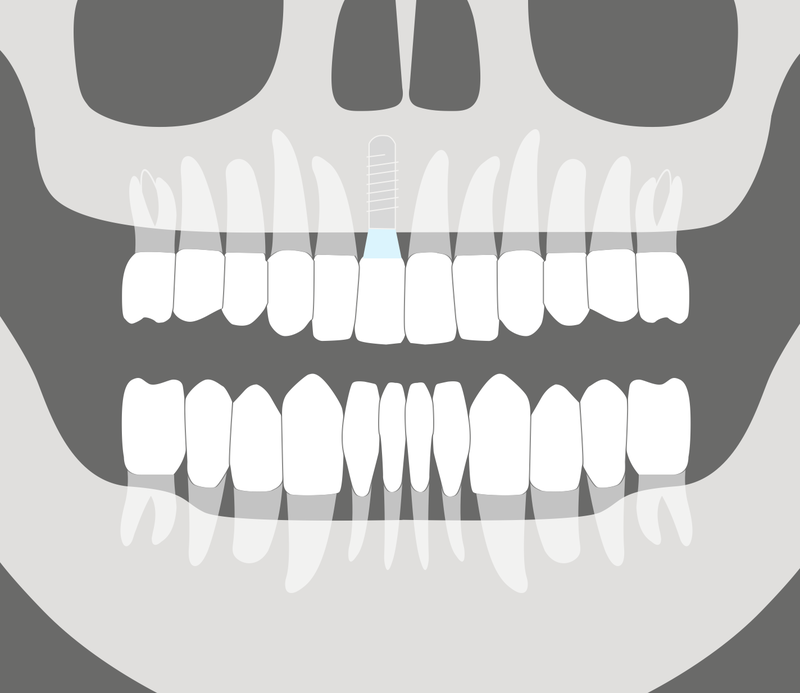 Zygomatic implants are the fastest solution for patients with severe atrophy of the maxillary (upper jaw) bone. 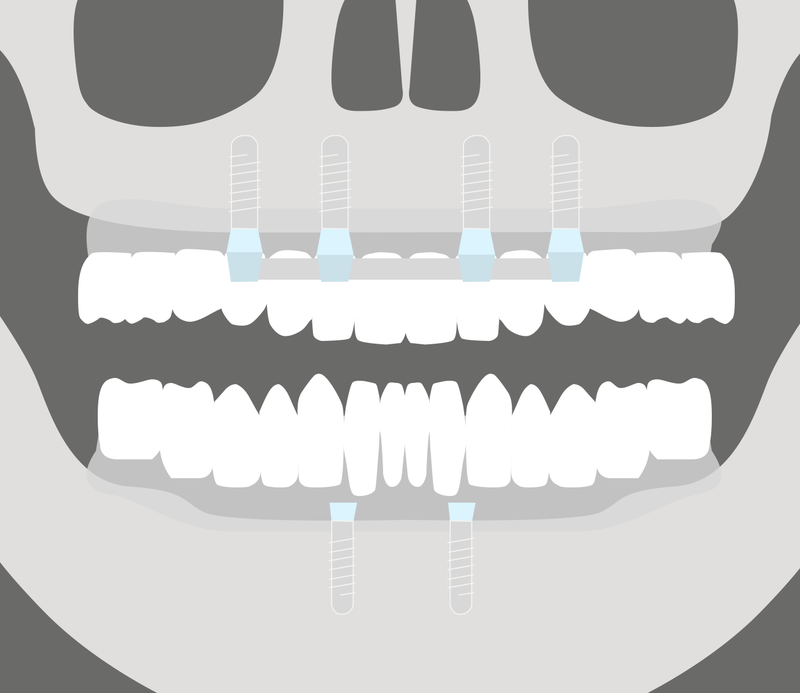 The patient immediately regained his teeth’s functional ability and their appearance. Treatment carried out in collaboration with the surgeon Dr. Carlos Aparicio. Maxillary hybrid prosthesis over 4 zygomatic implants. 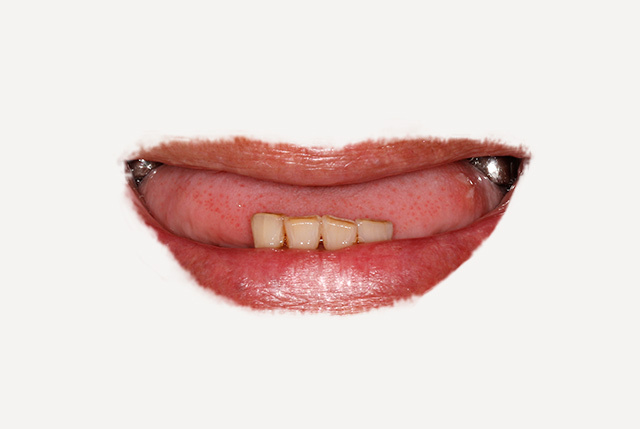 The loss and prolonged absence of the upper teeth causes the teeth in the lower arch to grow more to compensate, giving an incongruent appearance between the upper and lower jaws. The profile of the bite and the layout of the teeth when smiling are reversed, giving the appearance of a “grumpy or angry mouth”. 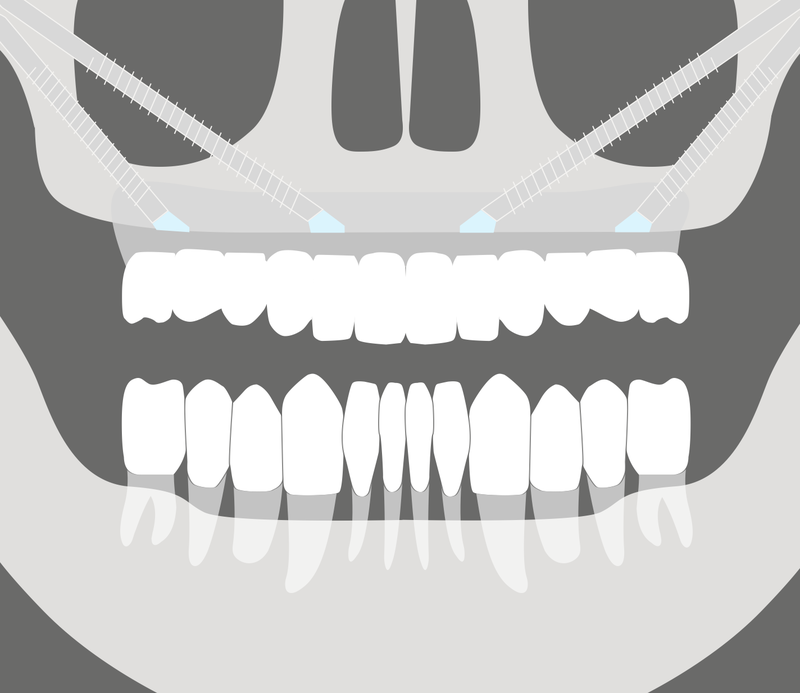 In order to replace all the teeth in the upper arch, eight implants were chosen, with the advantage of being able to replace the teeth with short sections or bridges, which will always be lighter than a complete arch structure or a single piece. 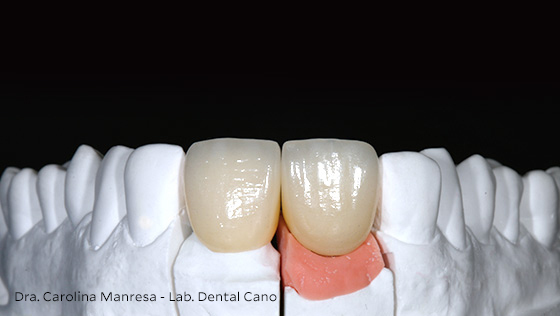 To replace the four lower incisor teeth, it was decided to make a metal-ceramic bridge (with CAD-CAM technology) over two implants. 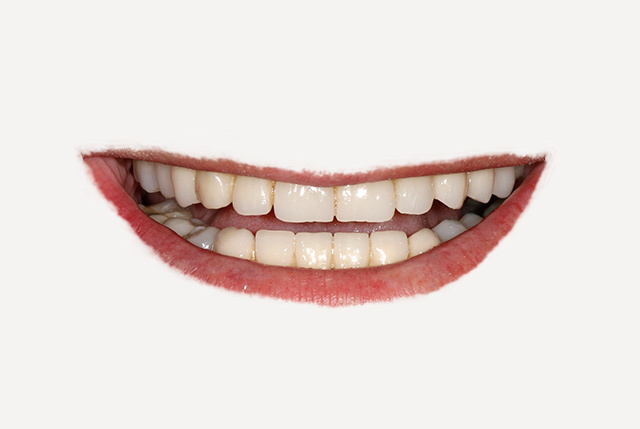 The design of the teeth took into account a correct bite profile and the patient’s smile. Metal-porcelain bridges over 2 impl. 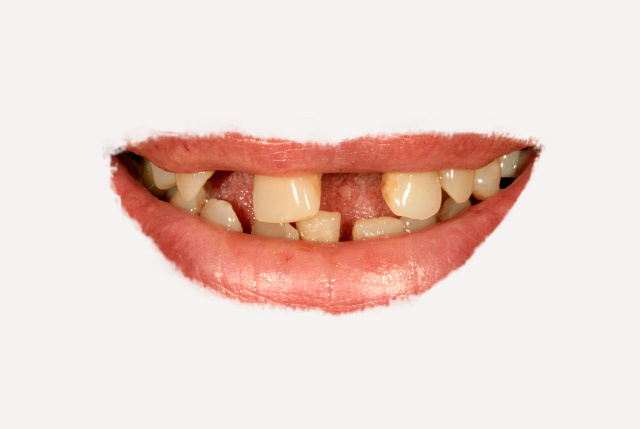 Certain medications lead to a dry mouth, which in turn can create the conditions for widespread decay to appear (rampant decay) that affects the teeth’s crowns and roots. 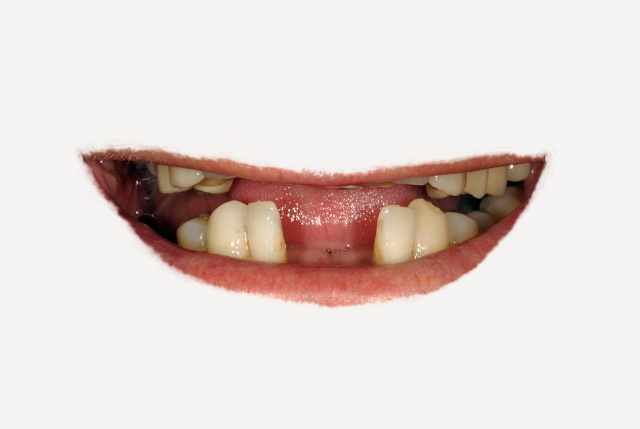 In some cases it is too late to save the teeth and it is advisable to extract them. 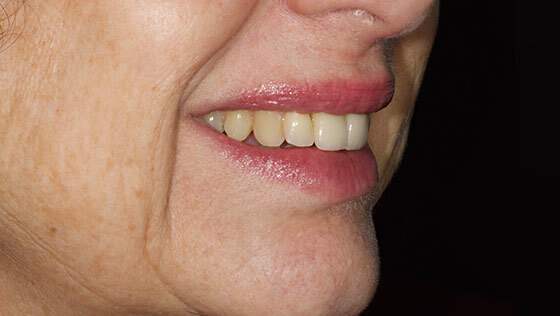 The replacement of this elderly patient’s teeth was a solution halfway between the classic removable denture and hybrid prostheses over implants (fixed acrylics). 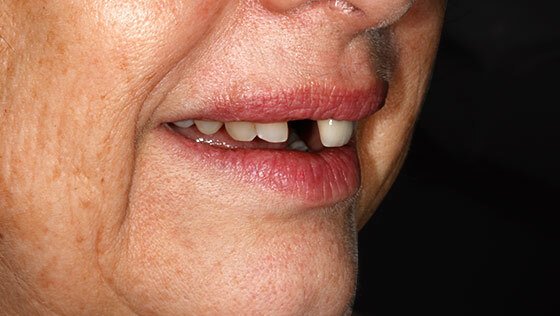 This is what is known as “overdentures”: the prostheses are held in place with attachments called “clips”. 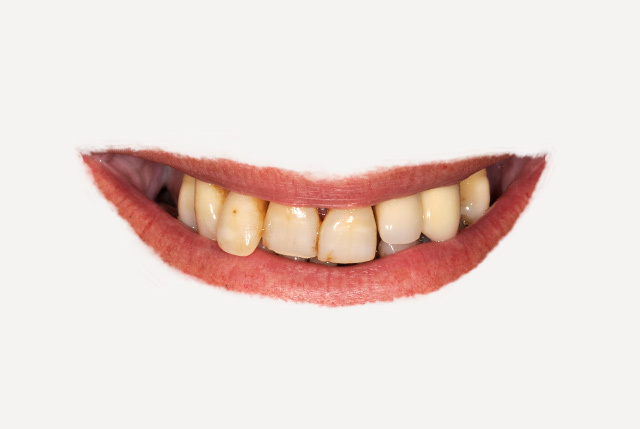 With a few implants (usually two in the lower jaw and four in the upper jaw), the dentures are held fast, preventing inconveniences like sores or irritated gums. 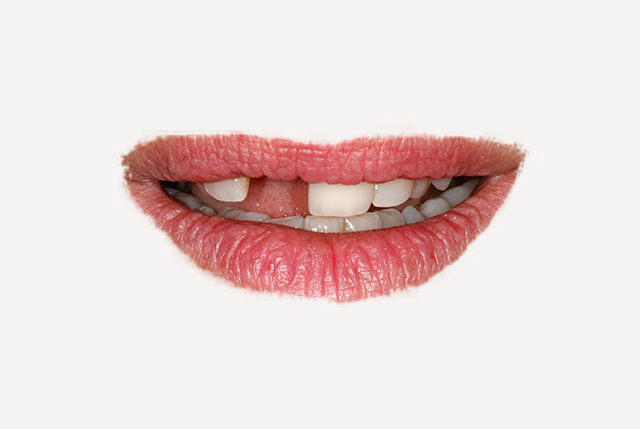 For oral hygiene, the patient can remove them and fix them in place again.